Maybe it's the Halloween season or, more likely, just my constant craving for cookies and peanut butter that had me wanting to make some monster cookies. I had the notion for a while to make some "mini monsters", a diminutive version of the typically gigantic-sized monster cookies. I was totally thinking of my son, who is my very own little "monster" (just a corny little joke - haha). So who better to present you with our mini monster cookies than the little man himself (I told him I would write all this so he's in on the joke). These are based on the same monster cookie recipe I've made before from Baked, the one that made me realize I'd been missing out by never having had them before! It also made me realize that m&m's in cookies are a very good thing. 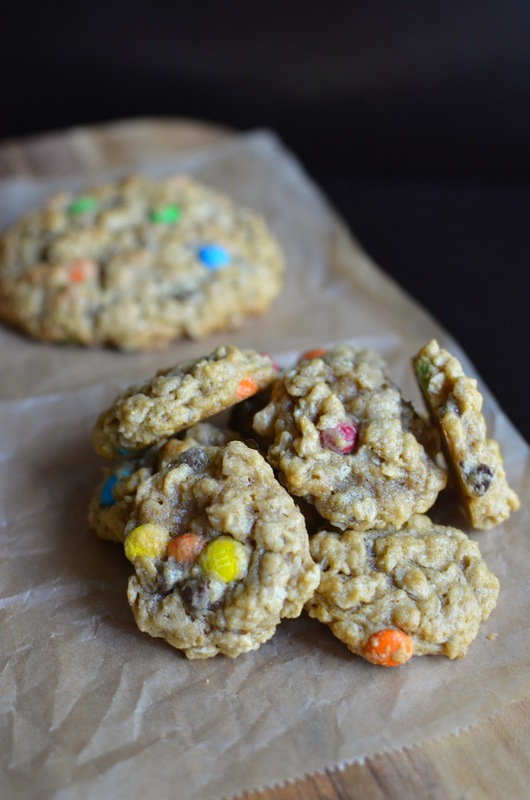 This recipe is so very tasty, chock full of oats, loaded with peanut butter, and all the better with chocolate chips and those m&m's. The change I made here was to use white whole wheat flour - though, believe me, you hardly notice since there is minimal flour in this recipe. I also used miniature chocolate chips and mini m&m's for the obvious reason. ...because even a half batch of the recipe makes a ton so I won't lie to you and I'll tell you that I made not only mini monsters but also medium monsters and even a few traditional big monsters. All were devoured and we had fun picking out the sizes we wanted and joking around about them. But the most important thing comes down to taste. If you love peanut butter, super chewy cookies with oats, with chocolate thrown in (or mix in whatever else you like), these are so satisfying! I made half a batch of the original recipe and if you were to carry out and make mini monsters out of the whole thing, using a rounded teaspoon of dough (almost 2-teaspoons in essence) for each cookie, you would likely end up with something like 7 dozen mini monster cookies! Clearly, this is a great recipe for sharing. Plus, remember to freeze some cookie dough balls for another time when the craving hits again, as it surely will! My math could be off quite a bit because I made a combination of mini's as well as larger cookies using small and large ice cream scoops. Bake each size individually at a time since bake times will vary. My mini's took about 7-8 minutes. The medium sized ones (scooped with a small #50 scoop that holds 1 1/4 tablespoons of dough) took 10-11 minutes, while the large ones (1/4 cup mounds of dough using a #16 scoop) took about 13 minutes. Just remember that the cookies are done when they are set and turn a bit golden on top. Let them sit for a few minutes on the baking sheet to cool and set enough to remove from the baking sheet since they are very moist thanks to all that peanut butter. Monster cookies are great for customization. Had I some rice krispies, I would have liked to put some in. I have yet to try rice cereal in cookies and I'm very curious as to whether it would be crunchy or chewy once baked. My guess is a combination of both but maybe more on the chewy side? I'd love to know if you've tried it! Would you rather have one giant cookie, or a bunch of mini ones? Why not try both? I was also thinking this recipe would work well as bar cookies, too. As you can see, I am coming up with all sorts of excuses to eat these monsters. Well, we got to satisfy our peanut butter, cookie cravings and have a little fun in the process. When all else fails, thank goodness there are cookies to put a smile on our faces! Place cubes of butter into the bowl of a stand mixer and beat until pale and smooth. Add the sugars and mix on low speed until incorporated. Avoid over-mixing. Remove bowl from the stand mixer and lightly stir in the mini chocolate chips and M&M's with a rubber spatula. Cover the bowl tightly and refrigerate dough for 5 hours. When ready to bake, preheat oven to 375 degrees and line 2 baking sheets with parchment paper. Scoop out rounded teaspoons of dough (nearly 2-teaspoons worth) and place them onto the baking sheets, about 1 1/2 inches apart. You can give the dough rounds a quick roll in your palms for a more even shape. Bake until cookies are set and beginning to brown, about 7-8 minutes rotating the pans halfway through the baking time. Cool the cookies on the cookie sheets for about 10 minutes before transferring them to a cooling rack to cool completely. Continue with the rest of the dough. The cookies can be stored in an airtight container, at room temperature, for about 3 days. Variations: You may not want to make your entire batch of cookies in mini form. Bake them any size, keeping an eye on doneness as the cookies are ready when set and beginning to brown. I found that using a small #50 ice cream scoop which holds a little over a tablespoon of dough (for "medium monsters"), the cookies take about 10-11 minutes. For the traditionally large monster cookies, I use a #16 ice cream scoop that holds 1/4 cup of dough and the cookies take about 13 minutes or so in my oven. Also, you can vary the mix-in's for this recipe. Use some combination (totaling 1 cup for this recipe) of ingredients such as: toasted nuts, dried fruit, pretzel pieces, puffed cereal, rice crispies, cornflakes, Reese's pieces, toffee bits, etc. Wow - that's one huge batch of cookies! So glad you enjoyed them. The mini cookies are adorable. Yes, and that is literally half of the original recipe so imagine that! It could feel a town...not a bad thing! I believe these would completely satisfy that "peanut butter oat cookie with chocolate craving!" I could eat more of the little mini monsters and feel like I was doing good! Love the big ones too :) Have a great weekend Monica! And I find myself with exactly that craving so often lately, Tricia! These cookies are the perfect amount of chewiness. Incredibly chewy, just the way we like it when we're craving chew cookies! I will take the mini ones. I love that you used wholewheat and oat in these adorable monsters. These are adorable monster cookies! Chewy cookies are my favorite especially if they have oats :) Love the mini M&M's in here too - and I adore that picture of the three sizes you made - so fun! Love that you used white whole wheat flour in here too - I will take them all min or big - they look delicious! Fun and tasty cookies Monica! There is something for everyone in these chewy morsels :-) Have a great weekend! I did have fun making it - must be the colors, the candies, and the aroma of the peanut butter. But really, they taste so good! Yes! I need to be more adventurous to actually put different things in there, Wendy! Thank you so much about the rice krispies. I am very curious and you're right...the texture probably depends on the situation. I hope you try these! Thanks, Wendy. I will take both! That is if I have any left over after baking these at my place. My kids will finish them in seconds. So many lovely things in these cookies. I bet these are DIVINE!. That's what I ended up doing! The little ones make you crave more so maybe the larger is the way to go after all. haha. My kid loves them so hope yours will too. I like everything mini, these cookies are really cute...and yes, chewy cookies are my favorites! Thanks so much. These have the chewy factor fully covered - you are so right! I got me convinced! The cookies looks fantastic. They are very tasty. Thanks! haha - children (and adult) approved here! Mini monsters! What a fun name! And what better way to photo them then with your son holding them! They sure do sound delicious. It's been soooo long since I've made monster cookies! Hi Monica, wonderful combination with the oats and chocolate, I could get in a lot of trouble with these. Am I allow to take them all? I heard about Monster Cookies. My kids will love these!! haha - for sure! That's what we did, just talking about the sizes and gobbling them up as we go. : ) If your kids like PB, it's bound to be a hit. My son loves 'em and so does his parents! My daughter would love these. So cute and delicious!! I think so...this recipe is a knock-out, seriously.